As consumers increasingly rely on technology when they shop, the retail industry is nearing a state of “retail singularity” in which bots, natural language voice interfaces and broadly integrated data react to and predict the what, when and why of shopper preferences and behavior. Store-based retailers need to integrate the best of the online and offline shopping experiences in order to create synergies that help unlock new potential, said Jeff Donaldson, CEO of Intriosity and former SVP of GameStop. Consumers are increasingly opting to engage in experiences that create the illusion of participating versus spectating. The rise of Amazon has coincided with this cultural shift. 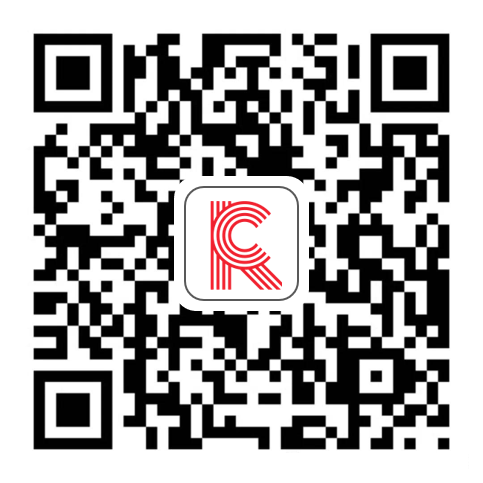 Coresight Research CEO and Founder Deborah Weinswig commented that China is a leader in artificial intelligence (AI) and robotics in the New Retail environment, where the integration of online and offline retail, logistics and data across a single value chain is essential. AI and automation are the keys to making everything work, she noted. Mark Mathews, of the National Retail Federation (NRF), said that the retail technologies that are resonating most with consumers are those that enable them to buyonline and pickup in-store, navigate in-store and pay by mobile device. The Coresight Research team attended the inaugural Retail Robotics & AI Conference in San Francisco on April 26. The conference was hosted by the Retail Analytics Council (RAC), an initiative between Northwestern University and the Platt Retail Institute that focuses on studying consumer shopping behavior across retail platforms and the impact of technology on retail. 1. As consumers increasingly rely on technology when they shop, the retail industry is nearing a state of “retail singularity” in which bots, natural language voice interfaces and broadly integrated data react to and predict the what, when and why of shopper preferences and behavior. Don Schultz, Director of the RAC and a professor at Northwestern University, kicked off the event by discussing AI’s impact on retail. As consumers increasingly rely on technology when they shop, the retail industry is nearing a state of “retail singularity,” he said, in which bots, natural language voice interfaces and broadly integrated data react to and predict the what, when and why of shopper preferences and behavior. Schultz said that AI has the potential to significantly transform retail, citing a McKinsey&Company study of 400 use cases across 19 industries that found AI to have the highest potential impact in retail. He said that market intelligence and advisory firm International Data Corporation (IDC) has predicted that, by 2019, 40% of digital transformation initiatives will be supported by cognitive computing or AI. Schultz noted that retailers are showing increasing interest in technology, but that implementation is lagging in the industry. He said that AI deal valuations had risen by 22 times in two years, noting that 32 deals in 2015 represented a combined value of less than $1 billion, while 130 deals in 2017had a combined value of more than $22 billion. However, only one in 20 firms are extensively deploying AI, Schultz said, referencing a Boston Consulting Group study. “We are all experimenting and piloting, but have yet to get to the point of using the technology extensively to transform the business,” he said. 2. Store-based retailers need to integrate the best of the online and offline shopping experiences in order to create synergies that help unlock new potential, said Jeff Donaldson, CEO of Intriosity and former SVP of GameStop. Jeff Donaldson, CEO of Intriosity and former SVP of GameStop, moderated a panel discussion with Chad Stiernagle, former Senior Director of Automated Retail at Best Buy, and Jonathan Kough, Manager of Store Initiatives at Ahold Delhaize. The conversation ranged from utilizing robotics and AI in retail to changing consumer shopping behavior. Donaldson suggested that robots should be designed with a “human-centric” approach, whereby they are built to solve a problem to satisfy the needs of shoppers. 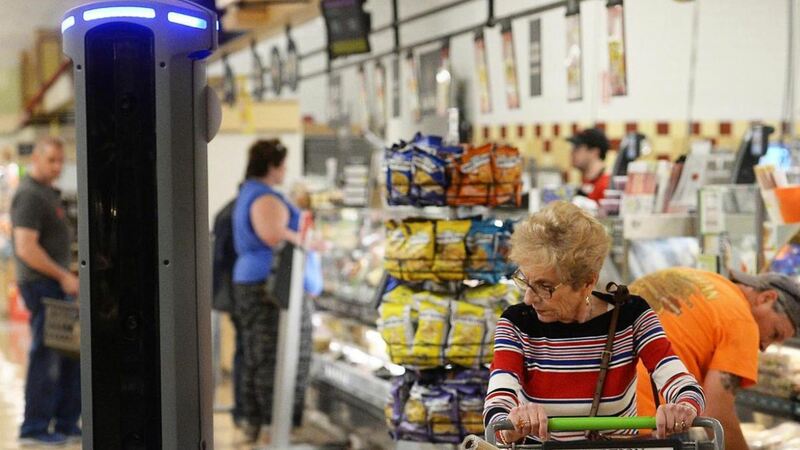 In some cases, robotics may not be the best approach to a retailer’s problem, he said, citing seamless checkout as an example.At checkout, a self-checkout platform may be a better solution than a service robot, he noted. Store-based retailers need to integrate the best of the online and offline shopping experiences in order to create synergies that help unlock new potential, Donaldson said. He suggested that retailers will find the answers by using data, insights and creativity to determine how to right-size, right-purpose, right-assort and right-invest in physical locations. Stiernagle discussed his experience at Best Buy, where he led the design and implementation of Chloe, a robot that the company implemented at a Best Buy store in New York City. Chloe is one example of a retailer using a robot for in-store fulfillment and to supplement and/or replace store staff. Inside a 350-square-foot vending machine with glass walls, Chloe’s yellow arm retrieves merchandise that customers have ordered via touch screen. Chloe can take commodities off the sales floor, manage inventory, be used for in-store pickup and free up store staff for other tasks. Ultimately, physical stores will not compete for the same dollars that shoppers spend online, Stiernagle said. Physical stores will play an entirely new role as they transform into locations that fill in the natural gaps in digital shopping, he said. They will provide rich, branded experiences and a convenient location for shoppers to access inventory. Kough said that Ahold Delhaize has increased its focus on robotics technologies and AI solutions. The company partners with Retail Businesses Services to connect with US-based technology companies in order to explore new technologies. One such company, Badger Technologies, offers an autonomous robot developed for grocery retail to address out-of-stocks, planogram compliance, price integrity, and audit and compliance issues. The robot supports Ahold Delhaize’s Peapod, Stop&Shop and Food Lion grocery banners. 3. Consumers are increasingly opting to engage in experiences that create the illusion of participating versus spectating. The rise of Amazon has coincided with this cultural shift. In a panel discussion titled “Academic Presentations,” companies discussed how they are applying deep learning and data science technology to solve real-world problems and how consumer behavior and consumption patterns are changing. Mike Tamir, Head of Data Science for Uber’s Advanced Technologies Group, is building out a data science product that scores the credibility of text and classifies content as news, editorial, satire, hate speech or fake news. The algorithm is designed to scan articles to detect increased emotional content and text intended to manipulate versus credible information, with the goal of determining what is true and what is false. The deep learning–powered algorithm keeps track of previous inputs and outputs to improve over time. Tamir said that the technology can be applied to inventory management in order to make forecasts based on previous inputs and historical patterns. Martin Block, Executive Director of the RAC and a professor at Northwestern University, discussed consumption patterns and changing consumer preferences. He said that consumers are getting older, that fewer are married, and that income and education levels are rising, as is confidence in the economy. Block argued that consumers are increasingly opting to engage in experiences that create the illusion of participating versus spectating. He said that people are spending more time online and on social media and less time watching TV, noting that NFL TV viewership and attendance ratings are declining, but that fantasy football participation is on the rise. He also said that free shipping is the most important factor influencing online behavior, and that it is online shoppers who respond most to promotions, consume the most media and make the most purchases. Block noted that a Prosper Insights & Analytics survey of US adults found that49% of US adults have an Amazon Prime account. Amazon users are more likely be married, use a voice assistant, have a higher income and have a dog than the average shopper, he noted,adding that Amazon users tend to prefer more interactivity and to participate more in activities. The age group most willing to share personal information is the 25–34-year-old demographic, Block said, and that pattern is also seen among shoppers who prefer Amazon, especially among married women. Block concluded by saying that the rise of Amazon fits with the cultural shift from spectator activities and entertainment to participant activities. 4. Coresight Research CEO and Founder Deborah Weinswig commented that China is a leader in artificial intelligence (AI) and robotics in the New Retail environment, where the integration of online and offline retail, logistics and data across a single value chain is essential. Weinswig said that China is a leader in terms of using AI and robotics in retail. She noted that AI and automation are the keys to making everything work in the New Retail environment, where it is essential to integrate online and offline retail, logistics and data across a single value chain. Weinswig highlighted Alibaba’s successful deployment of AI during its 11.11 Global Shopping Festival (Singles’ Day) in 2017. Alibaba’s AI customer service chatbot handled 95% of inquiries on Singles’ Day last year, and AI enabled merchants to generate 60 billion personalized shopping pages on Taobao and Tmall. Weinswig also discussed how retailers in China are using facial and object recognition in stores to understand how different types of customers shop and to provide a checkout-free experience. She noted that Alibaba-backed startup SenseTime, which is the world’s highest-valued AI startup,powers facial and object recognition to provide checkout-free shopping and personalized promotions. Meanwhile, Tencent’s YouTu Lab enables customers to make offline purchases and pay via WeChat using just their faces, Weinswig said. 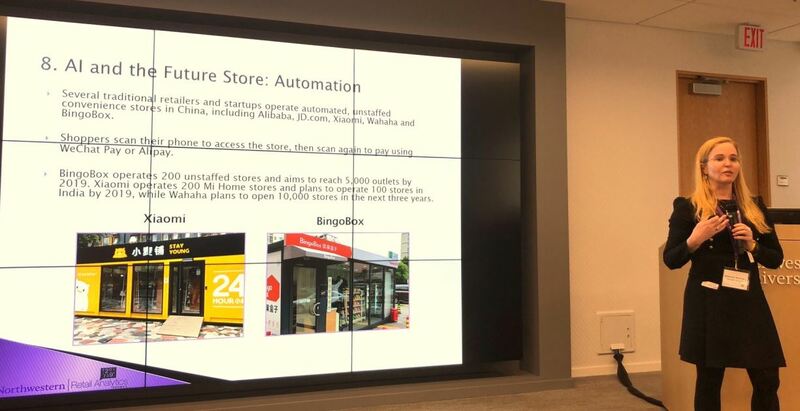 Chinese retailers are also using AI to offer new shopping experiences in the form of automated, unstaffed convenience stores. Several traditional retailers, including Alibaba, JD.com, Xiaomi, Wahaha and BingoBox, operate these kinds of stores. In terms of warehouse robotics, JD.com is using computer vision–powered robots that separate packages by zip code,Weinswig said. Andra Keay, Managing Director at Silicon Valley Robotics, an industry group supporting innovation in and commercialization of robotics technologies, expects robotics retail applications to increase significantly over the next two years. She said that the use of mobile robots, in particular, will grow, driven by rising computational power, increased autonomy and safety, and decreasing price. Keay provided examples of emerging robotics companies that provide solutions for last-mile delivery and fulfillment. She said that Starship Technologies is a startup that has developed an autonomous delivery robot aimed at corporate and academic campuses in Europe and the US. The company plans to launch around 1,000 robots by the end of this year on a number of as-yet-undisclosed campuses.Keay said that delivery giant DHL is also developing and testing ground-based autonomous delivery robots and that robotics startup Marble, which aims to transform food delivery, has partnered with Eat24 to test delivery by robot in San Francisco neighborhoods. Innovation in warehousing robotics is helping companies cut costs and save time. Fetch Robotics develops autonomous robots that operate alongside humans in locations such as warehouses, factories and distribution centers. Jeff Burnstein, President of the Association for Advancing Automation, said that robotics applications for warehousing and logistics have significant potential. He noted that Alibaba’s automated guided vehicle robots can process 1 million shipments per day at the company’s automated warehouses. 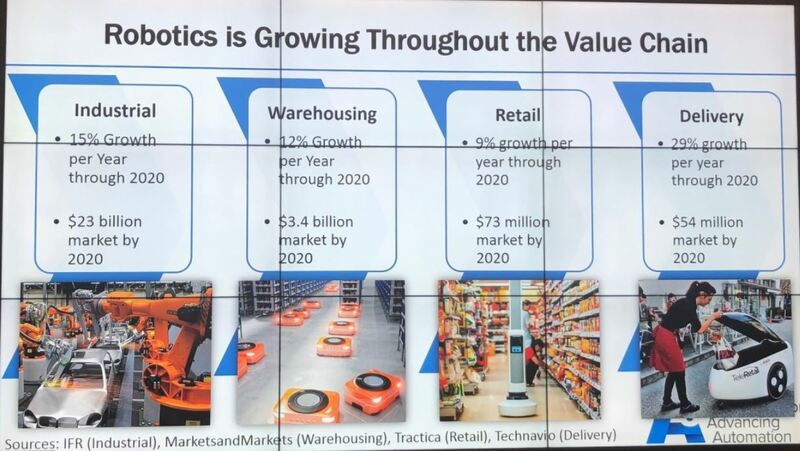 He noted that robotics usage is growing at many points along the value chain,including in industrial settings (where usage is forecast to grow by 15% per year through 2020), warehousing (12%), retail (9%) and delivery (29%). Online grocery retailer Ocado is getting closer to creating an autonomous humanoid robot that can help engineers fix mechanical faults in the company’s facilities.The retailer has already automated large parts of its warehouse operation. In terms of storefront applications, Burnstein noted Walmart’s pilots with Bossa Nova Robotics. He also suggested that as automated manufacturing and warehousing solutions become more viable, more companies like Foxconn will be able to manufacture and open new factories in the US. Mark Mathews, VP of Research Development and Industry Analysis for the NRF, said that consumers are the most satisfied with technology that streamlines the store experience, from finding and picking up items they need to checking out. According to an NRF survey, the retail technologies that most resonate with/impact consumers are those that enable them to buy online and pickup in-store (68%), navigate in-store (66%) and pay via mobile device (65%). 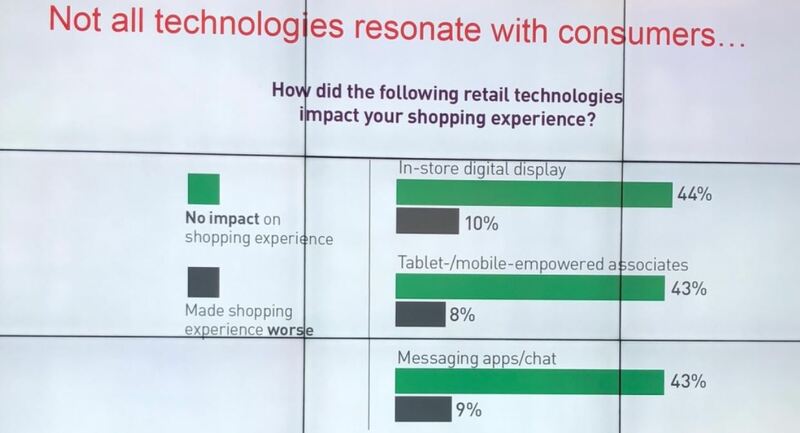 According to the survey, in-store digital displays, tablet-/mobile-empowered associates and messaging apps/chat technologies are among the retail technologies that many shoppers do not think significantly impact the shopping experience or even make it worse. 5. Mark Mathews, of the National Retail Federation (NRF), said that the retail technologies that are resonating most with consumers are those that enable them to buy online and pick up in-store, navigate in-store and pay by mobile device. Lori Schafer, Executive Advisor at the SAS Institute, discussed the importance of using AI platforms to pool together all processes across channels in a single platform in order to provide retailers with predictive insights into the customer journey. AI can help a retailer find patterns and correlations in unstructured data, which can then be used to make recommendations that fit particular situations, Schafer said. In a panel discussion titled “Robot and Retail AI,” Pano Anthos, Managing Director of XRC Labs, described how various emerging startups are using AI and automation to streamline processes and improve the customer shopping experience. Anthos highlighted StoreDNA, which is an in-store decision-making platform that uses deep learning to integrate store-level, customer-engagement data (collected via existing video feeds) with sales data from point-of-sale systems. Its digital dashboard then provides SKU, product category and fleet-level real-time insights. Anthos also highlighted Frenzy, an automated visual search tool for influencers, brands and retailers that can identify brand-specific products in fashion photos and make images instantly shoppable. Kristian Hammond, Professor of Electrical Engineering and Computer Science at Northwestern University, said that there are three important questions to ask when considering AI:Is your task data driven? Do you have the data that supports it? Do you need the scale automation provides? He said that data sets that are well structured and well understood can provide assortment optimization, dynamic pricing, customer targeting and shopping cart recommendations. Steven Keith Platt, Research Director at the RAC, said that machine learning experts are in demand, and that Google, Facebook and other technology companies tend to snap up graduates from top engineering programs. Given that such talent is in high demand, RACis looking to help retailers fill their hiring needs by presenting them with trained students looking for retail AI careers, Platt said.